I made a Top 100 list! 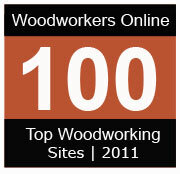 Woodworkers Guide: Top 100 Woodworking Sites. I just discovered that I’ve been included in a top 100 list on the linked blog above. That’s pretty cool, I wasn’t expecting that and I’m in some good company too.